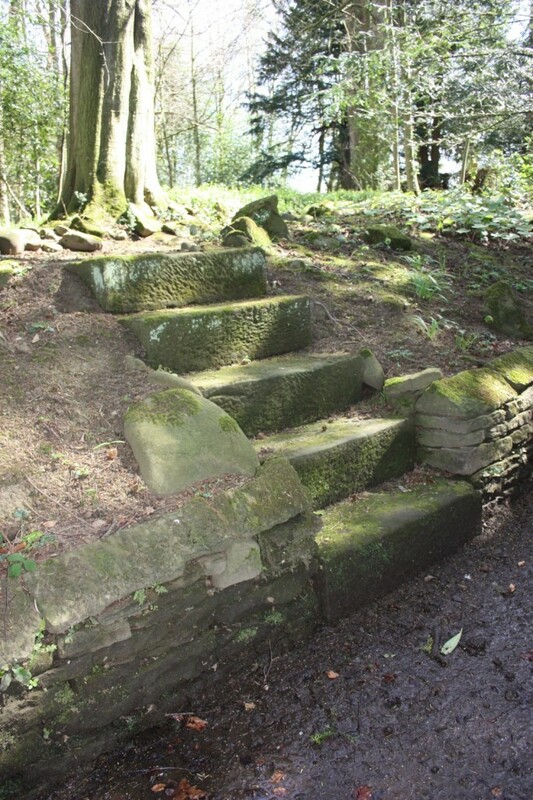 Simon and Joanna Riddell set about restoring the house and gardens in 1992, which had fallen into disrepair. Set in eleven acres of gardens surrounded by parks of grazing sheep, the garden was essentially a “gentleman’s” garden’, a formal layout with a great deal of holly and yew trees. 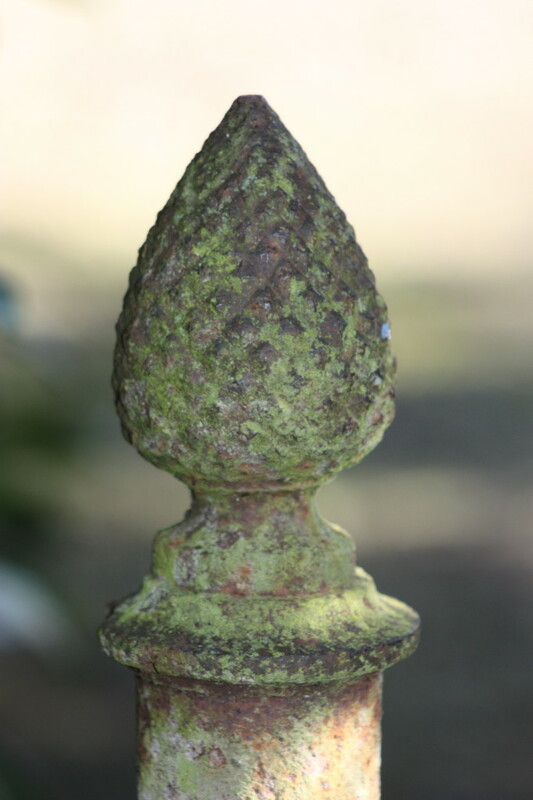 The house was exposed with sweeping lawns around it, and there were no obvious boundaries to the east of the house. Much of the garden was left and cut for hay right up to the house walls. An old orchard occupied much of the east side, and there were no flower borders. To give some underlying structure to the east, a long retaining stone wall was built and repetitions of pink roses (Felicity, Penelope and Cornelia) were planted at its base. Their scent is heavenly, and in July it is a glorious vista. 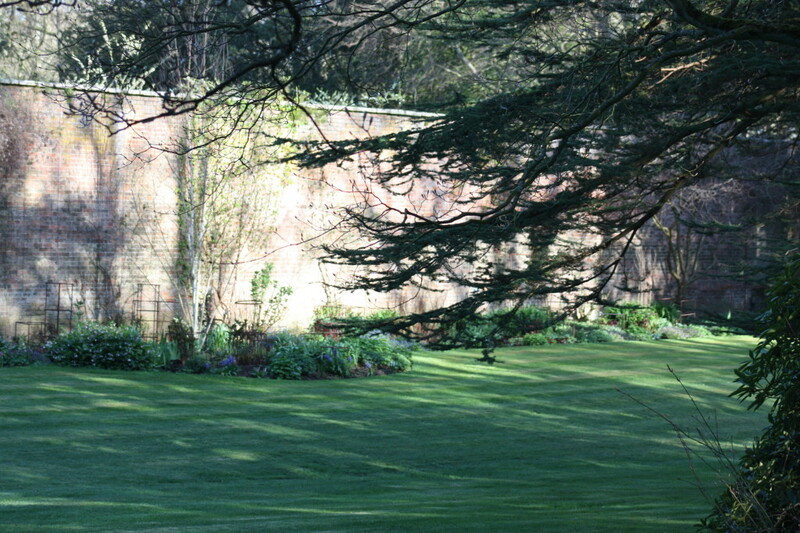 Above the wall is an elevated area planted out with white flowering cherries and underplanted with swathes of daffodils. 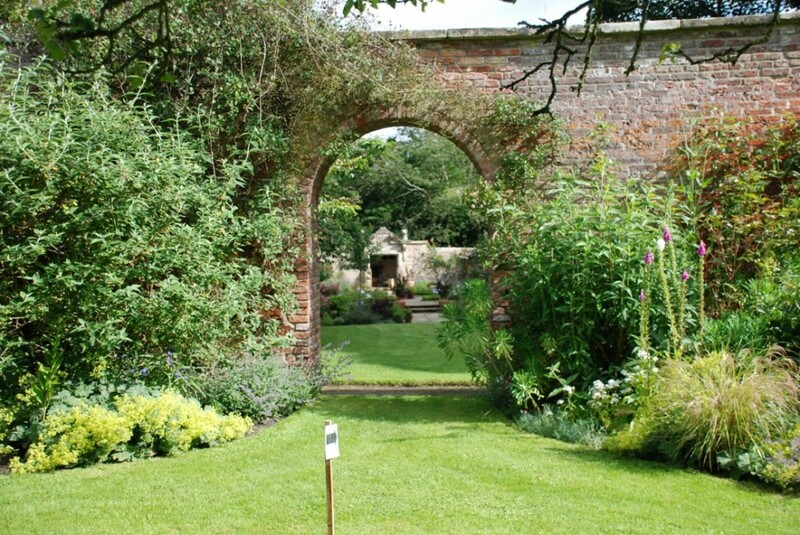 An immensely tall brick and stone wall some 18′ high gives a spendid backdrop to an herbaceous border. Climbing roses and clematis have freedom to roam, shrubs give height to the border; philadelphus is grown for scent and a contorted hazel for its twisted branches in winter. There is a mixture of perennials from the white tracery of flowers on Crambe cordifolia, spires of foxgloves, huge spiky, silvered onorpodum thistles, colourful irises, large leaved rodgersias and shrub roses. 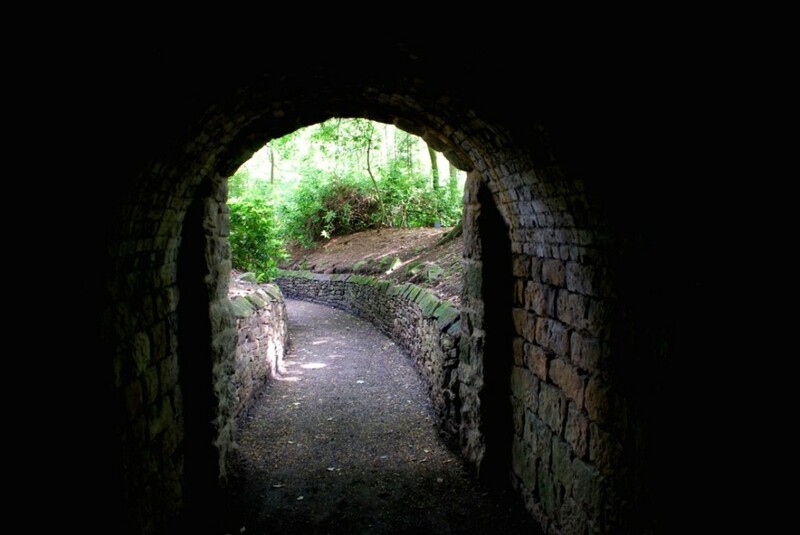 A large round arch was set in the wall to invite one into the next garden, originally an abandoned rose garden, but now transformed into a delightful parterre garden, laid out in front of a wall containing the original doorway to the house. 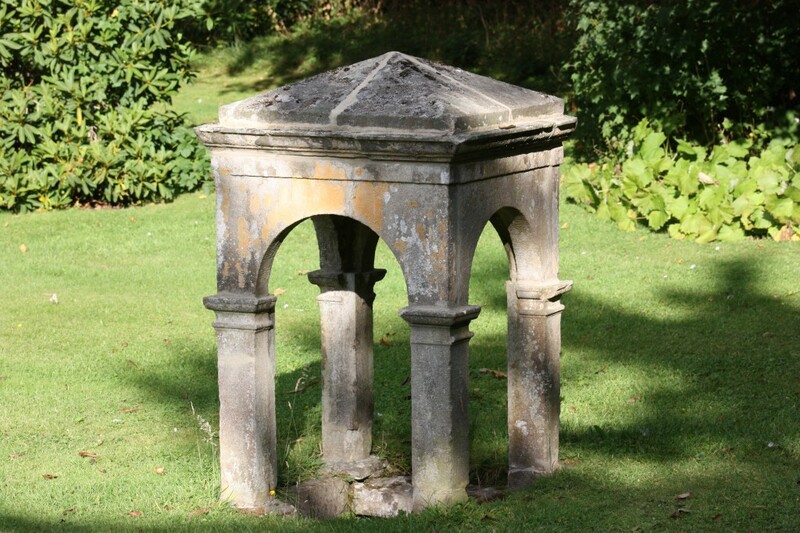 A wonderful feature for the garden, this 1790 portico was moved by Dobson in 1815 and has a central shield known as a ‘marriage plate’. The parterre beds are a combination of scented plants and herbs, edged with dwarf box and lavender, and have formal precision. The colour scheme is restrained with shades of white and pink and nodding purple alliums. 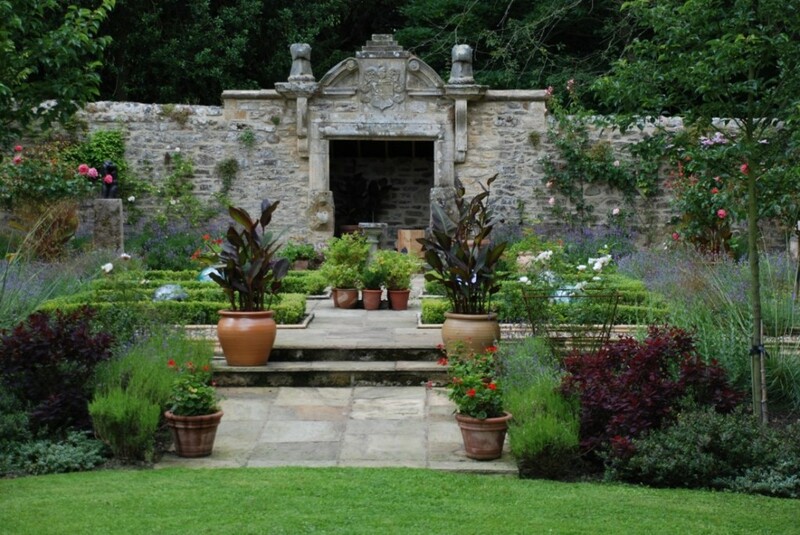 Splashes of bright colour appear from the pots positioned at the corners of the parterre beds with pelargoniums. Towards the outer beds, the plants grow taller with grasses mixed with perennials, large flowered alliums, echinacea, blue marram grass and hostas in the shade of shrubs. 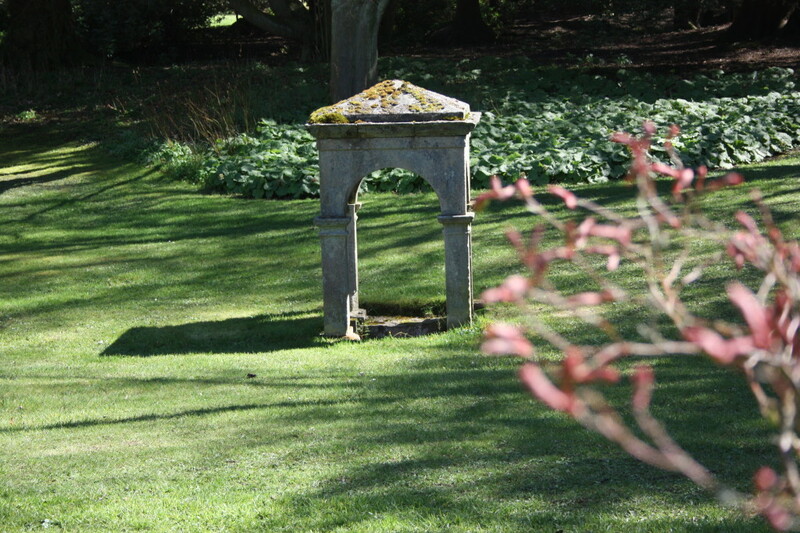 Dark leaved cannas and bamboo make dramatic upright shapes in large pots to either side of the portico, and a pair of Lutyens benches make this an ideal spot to bask in the sun and enjoy the scents and sculpture sited on the lawn. 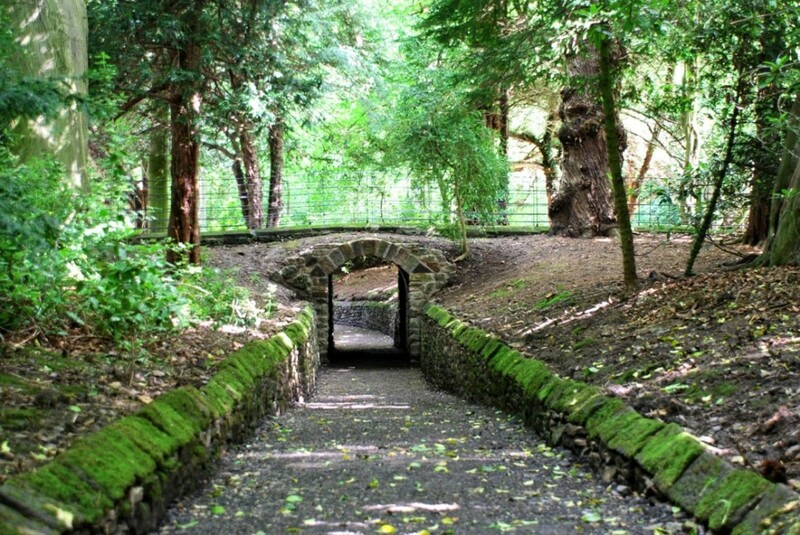 From here one can walk along the sunken ‘cave walk’ surrounded on all sides with tall, mature trees, enjoy the dappled light and listen to the birdsong, and emerge into another magical space. 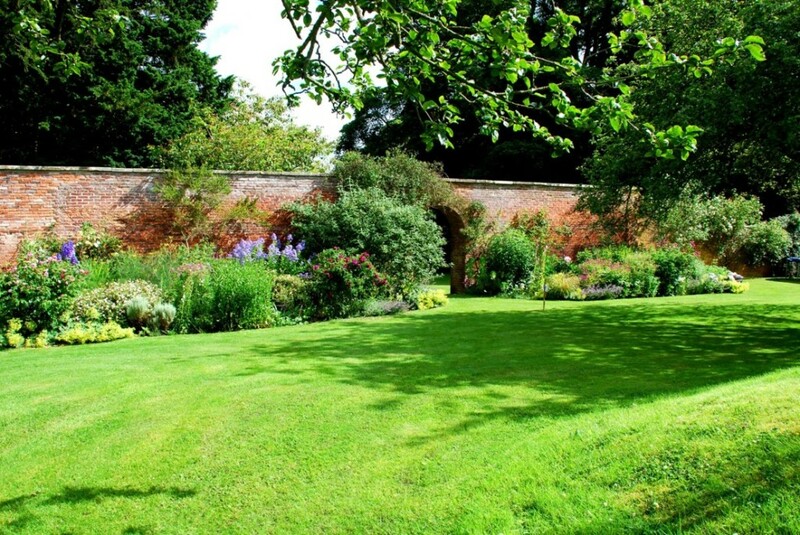 A garden on the east side of the Victorian Walled Garden, dominated in the centre by an ancient Cedar of Lebanon, one will discover another large border of perennials, and beyond this wall the enormous space of the original walled garden.